Friends, today is the first day of a new session of this Legislature. And it is also International Women’s Day. It is therefore right to begin this address by remembering the remarkable achievements of Alberta women. Like, for example, the story of Alberta’s “famous five,” who are remembered in a display in the rotunda of this House. Their fight was a fundamental one – the principle that no public office should be barred to women because of their gender. Which was a good start. I think you’ll agree with me – looking at this House, at the ministerial bench, and at the seat from which I speak – that we are still making progress. The fact that my government’s new Ministry for the Status of Women is led by a new mother tells us that further barriers are beginning to come down. Today – on International Women’s Day – we recommit ourselves to carrying on this work. And today, we return to this House to carry on our work for all the people of Alberta. As I speak, we are facing another deep slump in the international price of oil. Let there be no doubt. Albertans are going to get through this together, as we have done before. We will address the difficult choices that lie before us, in keeping with our deeply held values. Albertans are an optimistic, entrepreneurial, can-do people. And Albertans are community-minded, caring and neighbourly. Ours is a society of friends. In tough times, we always pull together. We have each other’s backs. We support each other in these times – instead of making a bad situation worse. We don’t need to put our short-term bottom line over the interests of long-term recovery. We do need to understand that this latest price bust is prolonged, deep, and driven by important and fundamental changes in the world market. And so we do need to act. We are currently over-dependent on a single commodity, a single price, and a single market. Alberta will address this in a number of ways. First, we will diversify our energy markets. Second, we will pursue a coherent and effective economic development strategy at last. Third, we will invest in a greener, more sustainable economy. Fourth, we will pursue a responsible approach to public finance. And fifth, we will pursue ongoing democratic reform to ensure public accountability in all of this work. Canada’s inability over the past ten years to pursue a strategic energy policy supported by Canadians has made it impossible so far for our country to diversify our markets. And the result is that Canadian energy exports are heavily discounted, even at these low prices. Canada’s energy industry – which is so important to the livelihoods and futures of Alberta families – must have safe and efficient pipeline access to tidewater, so that the energy production that is permitted under our Climate Leadership Plan can command the highest possible value on world markets. Furthermore, Canada’s energy industry needs access to the Canadian market itself. Canada currently imports almost a million barrels a day of oil from other countries. It makes no sense to finance the economies of other countries in this way, when it would be both more economically and more environmentally responsible for Canada to rely on its own abundant energy resources. My government has been pursuing these issues since its first days in office and will continue to do so with focus and determination. We will erase any doubts about Alberta’s environmental reputation within Canada and around the world through our Climate Leadership Plan, which places our energy economy in the ranks of the world’s most progressive energy producers. As I will detail in a few moments, a key enabling bill giving effect to this plan will be presented in this session of the Legislature. Alberta will also continue to strongly engage with the federal government and with all other provincial and territorial governments on these issues. The Canadian Energy Strategy adopted by the Council of the Federation last July provides Canada with a balanced framework both to protect the environment and to develop our country’s energy industry. At a meeting of first ministers in Vancouver last week, every government in Canada committed to the view that these issues are urgent and must be dealt with in a timely fashion. As a first step to that end, the Government of Alberta welcomes a new interim federal assessment of the environmental and climate issues that arise from new pipelines, because the strength of our Climate Leadership Plan places Alberta in the ranks of the world’s most progressive energy producers. We will continue to work towards a permanent regulatory regime that is effective and predictable, and that has a beginning, a middle, and a timely end. There is much that needs to be done here in Alberta in the face of the current economic shock. First, we must help the many Alberta families who are facing immediate financial hardship. Albertans are rightfully concerned about their livelihoods and their income security. At times like these, we must think of our children first. Starting this summer, my government will implement an important new Alberta Child Benefit Plan for low-income families – a $340-million investment in new direct help to the Alberta families who need help most. So, for example, a low-income single parent with two children will begin to receive just over $3,000 a year in benefits from enhancements to the Alberta Child Benefit and the Family Employment Tax Credit. In all, 380,000 Alberta children will benefit from this initiative – direct help now, to the most vulnerable and needy among us. Alberta is also vigorously urging Canada’s new federal government to reconsider federal Employment Insurance rules that exclude too many Albertans from benefits. These rules must be updated as quickly as possible, to take account of the current economic shock affecting the resource industry and related industries in western Canada. Measures will be introduced in Budget 2016 to expand access to workforce and skills training and retraining, so that people facing unemployment can upgrade their skills. And we will protect Albertans who are experiencing economic distress from being preyed upon by unscrupulous lenders. In some cases, these lenders are charging exploitative interest rates of up to 600% a year to Albertans least able to afford such fees. This has been allowed to go on for too long – Albertans need a government that will stand up for them when they are most vulnerable. To end these abuses, my government will introduce An Act to End Predatory Lending. Second, we must do everything we responsibly can, as quickly as possible, to promote job creation and economic diversification. Alberta is investing $34 billion into our provincial capital plan to help build the roads, transit, schools and other facilities our province needs to support the economy and create jobs. A province-wide slowdown in the construction industry has accompanied the drop in oil prices. Timely, worthy investments in infrastructure today will help keep thousands of tradespeople, equipment operators, engineers and other professionals at work, giving them the means to support their families. Our province is also making $1.5 billion available to Alberta Treasury Branches to support lending to small- and medium-sized businesses, and has directed AIMCo to earmark half a billion dollars for Alberta companies with growth potential. In an economic slowdown, businesses – whether large or small, new or established – often find their access to credit or investment capital restrained when they need it most to maintain or grow their operations. These programs will help give entrepreneurs the stability they need to weather this economic storm and create new opportunities for employment and growth. 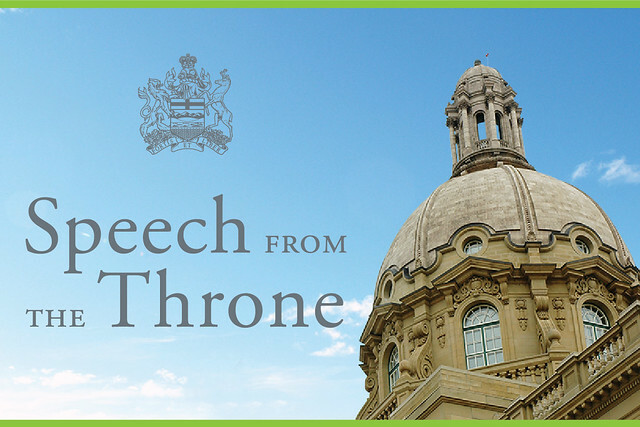 The Government of Alberta will do more to promote economic development in Budget 2016. Alberta will introduce further measures to promote access to capital for job creators. My government will set out plans to build on strengths in our economy – including in our agriculture and forestry industries – and to partner with communities and regions so they can act on their local economic strengths and opportunities. And my government will work with leaders in Alberta’s $23-billion credit union system to ensure they have the business tools necessary for their work, and to encourage them to support small- and medium-sized businesses in their communities. After a careful consultation with the credit union system, my government is aiming to modernize and strengthen Alberta’s credit union legislation in the fall sitting of the Legislature. My government will introduce the Promoting Job Creation and Diversification Act to provide the Minister of Economic Development with tools to pursue these initiatives and to report on results. Third, we will build on our strategic partnership with Canada’s new federal government. The Government of Canada has committed to a significant new investment in Canada’s infrastructure. Alberta will work closely with Ottawa to ensure federal investment in Alberta infrastructure promotes diversification and job creation as quickly as possible. Finally, we will work closely with our province’s energy industry to ride out this storm and look for opportunities within it. My government recently completed a review of Alberta’s royalty system, and will now proceed to reform it. This modernization will promote innovation and efficiency. It will remove disincentives to develop different forms of hydro-carbons. And it will provide full transparency and accountability to the public in the operation of royalties. As prices improve and costs decline, the public return from our resources will also improve. Alberta will work with focus and determination with partners to create new jobs and diversification in the energy industry. Our aim is to move the energy industry up the value chain, to process and add value to our resources, and to diversify the energy industry into new end products. As a first step to this goal, a few weeks ago, my government introduced a $500-million Alberta Petrochemicals Diversification Program. In further pursuit of these goals, my government looks forward to the advice of a new, broadly representative Energy Diversification Advisory Committee to drive this priority forward and advise my government on additional steps Alberta can take to build a more diversified and resilient energy economy. My government will introduce the Climate Leadership Implementation Act to give force and effect to key elements of Alberta’s new climate plan. Every penny raised by this plan during this period of low energy prices will be reinvested back into the economy to create jobs and to promote diversification in our economy. And an adjustment program to assist coal-dependent communities, Indigenous communities, low-income families, and small business to adjust to and succeed in a diversified, lower carbon economy. A new, lean agency called Energy Efficiency Alberta will help families, businesses and entire communities reduce both their energy costs and their greenhouse gas emissions. We will work with the energy industry and with civil society to implement Alberta’s Climate Leadership Plan — which is strongly supported by key industry leaders in the oil sands — to help Alberta’s energy industry achieve the goal of being one of the most environmentally progressive in the world. Sands Advisory Group to ensure measures are effective and widely supported. The collapse of the price of oil, and therefore of public resource revenues, has gone directly to our province’s bottom line. In these circumstances, the Government of Alberta cannot meet current deficit targets, because the commodity price crash has proved to be deeper and of longer duration than projected. Alberta’s fiscal plans must therefore be revisited as part of the prudent, balanced approach my government will set out in its budget later this spring. We will protect health care and education services. In the circumstances we face, we will also ensure that all public spending, including on these services, is carefully and efficiently managed and that all possible economies are found. Further to this goal, my government will introduce the Reform of Agencies, Boards and Commissions Act. Over the years, compensation practices between the public service and our province’s agencies, boards and commissions have diverged – in some cases, significantly so. This reform will address this issue by introducing a framework to narrow and rationalize this growing divergence. This act will also improve public oversight and stewardship over these important public bodies, which will become more transparent and accountable and follow good governance practices. My government will have a great deal more to say on all of these issues when its budget is put before the House. My government is looking forward to the report of this Legislature’s All-Party Special Committee on Ethics and Accountability. The new Minister of Democratic Renewal will receive that report and lead early action on it. My government’s aim is to present legislation on the key democratic reform issues addressed by the committee in the fall sitting of this Legislature, with a view to adoption before the end of this year. My government will introduce a number of other measures this session. 22 – and will engage Indigenous communities on how the Crown should fulfill its consultation duties and support the capacity of Indigenous people. My government will consult Indigenous people on a new Indigenous People’s Sacred Ceremonial Objects Repatriation Act that would facilitate the return of sacred objects to the nations to whom they belong. My government will introduce An Act to Implement a Supreme Court Ruling Governing Essential Services to comply with recent rulings by the Supreme Court of Canada and Alberta’s Court of Queen’s Bench, which invalidated existing provincial labour legislation. My government will introduce draft legislation this spring modernizing the Municipal Government Act, and will then invite comment by citizens and municipal governments with a view to adopting a final version of the legislation this fall. An Act to Modernize the Enforcement of Provincial Offences will help police and the judiciary to focus on major offences, by simplifying and streamlining how minor offences are managed. And amendments to the Securities Act will permit the further modernization, national harmonization and streamlining of securities legislation. Friends, Albertans want to build an economy that is widely diversified and resilient to energy price swings: an economy that captures the full value of our resources, holds the promise of prosperous futures for our children, and shares its benefits widely and fairly among all Albertans. Albertans want to build a society that provides well-managed, efficiently financed, nimble, world-class health care, education and other public services. And Albertans want to build a society that gives a hand up to people who need it, cares for the vulnerable, and opens doors for our children and our grandchildren. This is what we wish for ourselves, and for all. We have seen oil price drops before. We will get past this one. And we will draw the right lessons from it, and act on them. That is exactly what my government intends to do in the budget and legislative program it will put before this House this session. God bless Alberta. God bless Canada. And God save the Queen.